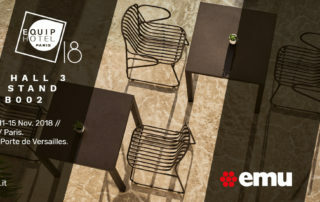 From November the 11th to the 15th, EMU will be at Equip’Hotel, the biennial event for Ho.Re.Ca. professionals, to present the company’s many news dedicated to hospitality. The new collections provide a complete response to the multiple needs of hotellerie, restaurants and cafeterias, offering modular systems of dividers, sofas, tables and new outdoor lamps; multifunctional and innovative collections that combine functionality and emotion to provide a unique and exclusive customer experience. Extremely marked the attention, as usual, to quality and sustainability of products and processes.